Q&A with, from left to right: Participants Chloe, Daphne, Lilly, and Grace; and Marcus Küchle, Director of Artistic Operations and New Work Development for the Cincinnati Opera and producer for the project. 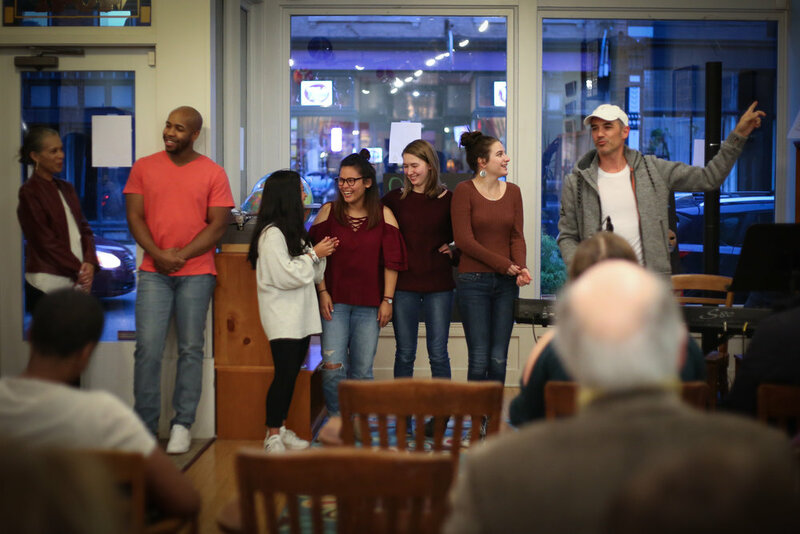 There’s a fantastic writing center in Cincinnati called Wordplay Cincy, and they recently gave the public an early look into a project called Girls 2020. The plan is that young women writers will collaborate with the Cincinnati Opera on a piece to be performed in the summer of 2020 at CO Next: Diverse Voices. These words-and-music projects always produce extraordinary results — witness the many similar collaborations afoot in Louisville. Pictured here are members of the opera working with Cincy students, including Azaria Carter and Daphne Constantinedes, two delegates to our recent International Congress of Youth Voices. -D.E. Two of the participating girls, Azaria Carter and Daphne Constantinides, with Program Coordinator Desirae Hosley. Grace from Music Resource Center performing an original piece.